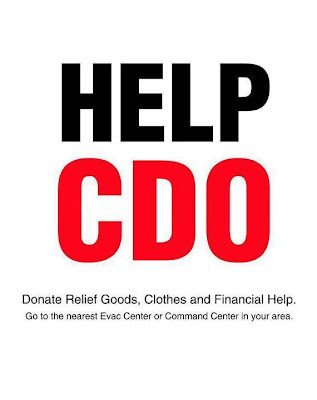 Xavier University is accepting donations at the Helpdesk set up at the University's front gate or at the Relief Center at the Satellite Canteen near the College of Agriculture building (beside the gymnasium). Personnel and student volunteers are being deployed to buy, pack and deliver relief goods all over the City, under the direction of the University Chaplain. Volunteers also needed @DSWD (Masterson Rd, Upper Carmen). SMART LIBRENG TAWAG, INTERNET and CELLPHONE CHARGING at PHILCOM OFFICE, MAX SUNIEL ST. CARMEN (RIGHT BESIDE ACSAT GYM) for those who would like to contact their loved ones who have been affected by the recent FLASHFLOODS. Please tell your friends, family and neighbors! through Cagayan De Oro Bloggers. More than 200 died and 400 missing as typhoon Sendong ravaged Cagayan de Oro. Proceeds will be donated and delivered to Xavier University Cagayan de Oro where the members of CDO Bloggers are planning to volunteer. Let us help Cagayan de Oro! Thank you and God bless you! *This is a re- post. Please re-post to get more help. This is really sad ate Rovie. :( Okay lang ba friends and families mo sa CDO? Some friends are slightly affected kasi baha lang but others lost their homes and properties talaga. Salamat lang sa Diyos kasi safe lahat ng family members nila. Ang challenge doon ngayon is water supply. Walang mapagkukunan. Sa bahay ng sister ko may mga friends and family sila na nakituloy kasi nawala ang bahay at lahat ng gamit ang iba may babies pa as young as one month old. OMG! Tama nga pala Rovz, ano? You were there a week before diba? I hope all your family are safe there. Sobrang busy ng buhay ko, kanina ko lang napanood sa TV ang kalunos-lunos at kahindik-hindik na pangyayari. And to think we've passed by at those affected areas on our way home. We were blessed with a good weather the entire time of our journey. I feel for all those hugely affected by this tragic calamity. Every little help counts at this time of need. I will do my share too. Prayers count for a lot more as well. Oo lagi Lainz... Thankfully, safe naman ang sister ko ang family nya. Ang mga relatives mga ng brother in law ko na nasa kanila ngayon. That's really bad, I know it through Paula of BC Bloggers' email and visit grace's blog too, send my pray and bless to all of them. what happened was really very sad.. hope things get better soon..
Hi Sis! Sorry for the late comment, minsan kasi dumadaan lang ako at medyo di super bilis ng internet connection dito. Anyways, I have already watched the video footage sa news and I really felt sad aout what happened to CDO. Alam mo parang naulit sa kanila yung nangyari sa Thailand. Grabe din yung baha dun inabot ng more than 3 months yung tubig. Anyway, thanks for posting this information, I'll do my share too. I've already offered my prayers last night nung nag mass kami ng mga bata. Hi Rovz, kakalungkot talaga 'tong calamity na 'to lalo pa palapit na Pasko. Medyo nakaka-guilty tuloy mag indulge thinking na may mga taong biktima ng sakuna :( I pray that CDO gets all the help it needs. Merry Christmas, Rovz and family :) Batiin na kita kasi busy-busyhan na for holidays. Nakakalungkot talaga isipin ang ngyari sa CDO. Ready na ang box namin filled with old clothes para ipadala sa mga naapektuhan ng bagyo.